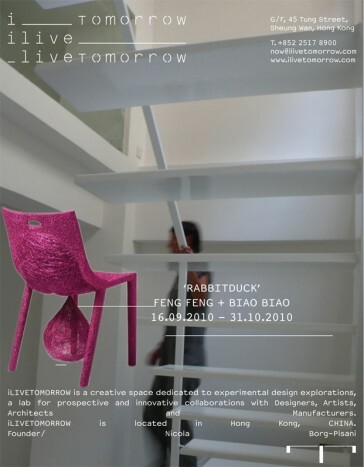 As a newly opened creative space in Hong Kong, iLIVETOMORROW is a creative space dedicated to experimental design explorations, a lab for prospective and innovative collaborations with Designers, Artists, Architects and Manufacturers. It is now showcasing an exhibition “RABBITDUCK” with the works of 2 Chinese designer and artist, Feng Feng + Biao Biao, based in Guangzhou, proposing an experience into the Archeology and the Metamorphosis of Actual objects. Their next exhibitions will feature works of designers from Japan, Taiwan, France, UK, Germany, etc.